Cleaning up your studio this spring can provide health and safety benefits as well as a cleaner and better organized workplace. Here are some ways to cover your art, assets and career this spring. The more dust involved with your art making process, the more important it is to control it via process enclosures and local exhaust ventilation. If there’s still dust exposure after taking those measures, then wearing a mask or respirator is important. Avoid kicking up dust when cleaning by wet-wiping surfaces instead of a broom. 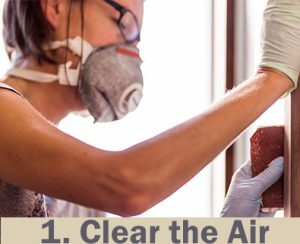 Spring may conjure up thoughts of fresh air, but is your studio air clean even if you have dealt with dust properly? Fumes from various art making processes can be very hazardous. After you have done everything you can to reduce the use of materials that produce dangerous fumes, take steps to control and exhaust the fumes, and wear a respirator if needed. Decluttering is always a good idea. Not only does it make your studio more comfortable and efficient for working. It’s vital to always have multiple, clear exits from your studio in case of an emergency. 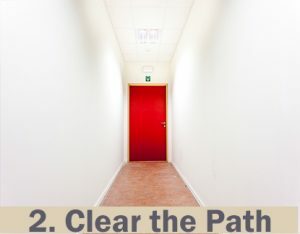 Don’t let clutter build up around your exits. Even if you don’t use large power tools in your studio, injury from accidents are more likely if your movement around the studio is hampered by clutter. An end-of-day decluttering routine makes for a safer studio regardless of your set-up. 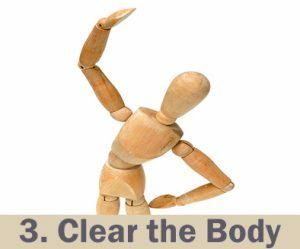 Once you’ve made sure your studio’s air and space is cleaner, you might want to think about how you move your body around the studio as you work. Can you work differently so that it’s easier on your body? Consider changes to your workspace so that work surfaces and shelves are within the optimum height range of 27.5 to 56 inches for easy access. Use carts or other equipment when moving items weighing more than 50 pounds around the studio. Have adjustable or multiple work surfaces to provide for more than one working height during the day. Try to schedule your day to avoid long sessions of the same repetitive activity. 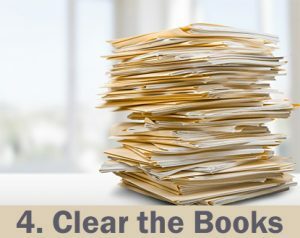 Getting your business and art records in order and in a safe place won’t make you safer and healthier this spring, but this kind of cleaning has many long-term benefits for your art business. Make sure you have inventory systems that document your art, sales, equipment and other assets. Invest in a simple accounting software system to streamline your work related finances. Always have a back-up of these records at an offsite location or in the cloud. Keep your vital records – what you would absolutely need to save in case of an emergency – in a container that you can easily grab if you need to evacuate. This spring, take a few extra steps in your studio cleaning. Strive for long-term health and safety for yourself and others in your studio, and for a more resilient art career. Click for more tips + resources.